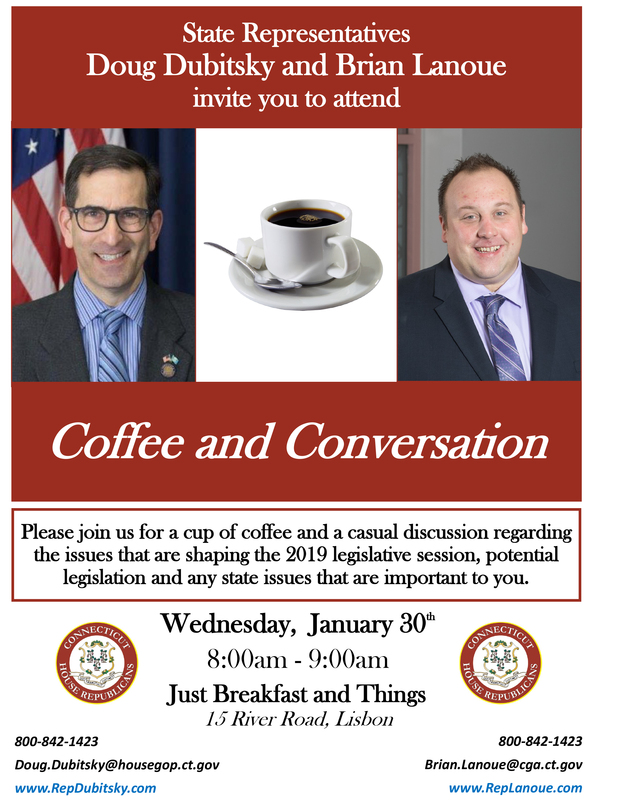 HARTFORD – State Representatives Doug Dubitsky (R-47) and Brian Lanoue (R-45) will be holding a joint legislative meeting in Lisbon at Just Breakfast and Things on Wednesday, January 30th, 2019. Representatives Dubitsky and Lanoue will discuss any items addressed during the 2019 legislative session along with any state-wide issues that are important to the residents of Lisbon and the surrounding region. From 8:00 to 9:00 a.m. These events are free of charge and open to the public. If you have any questions, or are unable to attend but would still like to connect with Representative Dubitsky or Lanoue, please email them at Doug.Dubitsky@housegop.ct.gov or Brian.Lanoue@housegop.ct.gov. You can also call them toll free at 1-800-842-1423. Please check Representative Dubitsky or Rep. Lanoue’s websites for any cancellations prior to the scheduled meeting date.